Which has never known fear or remorse ..."
If I had to choose a motto for myself, I would take this one -- "pure, dure, sûre," [pure, hard, certain] -- in other words: unalterable. I would express by this the ideal of the Strong, that which nothing kills, nothing corrupts, nothing forces to change; those on whom one can count, because their life is order and fidelity, in accord with the eternal. Oh, you who exalt the fight without end, be it without hope, attach yourself to what is eternal! That alone is; the remainder is only shadow and smoke. No individual, man or beast, no group of individuals, no people as such deserves your concern for them; each, on the other hand, deserves, as a reflection of the eternal, that you devote yourself to it to the limit of your capacities. And individual beings and natural groups reflect the eternal more or less. They reflect it insofar as they approach, on all levels, the archetype of their species, insofar as they represent it as living things. He who represents only himself, be he one of those who make and unmake history and whose name resounds from afar, is only shadow and smoke. You who exalt the image of the solitary rock delivered to all the assaults of the Ocean, lashed by the winds, battered by the waves, struck by lightning at the height of the tempest, unceasingly covered by the furious foam, but always standing, millennium after millennium -- you who would like to identify with your brothers in faith, with this tangible symbol of the Strong, in order to feel, "That is us! That is me!," free yourself from two deadly superstitions: the search for "happiness" and concern for "humanity" -- or take care never to fall into them, if the gods grant you the privilege of being exempt in your youth. Happiness -- which, for them, consists in unopposed natural development, to be neither hungry, nor thirsty, nor cold, nor too hot; to be able to freely live the life for which they are made, and sometimes, for some of them, also to be loved -- would have to be granted to living things which do not have the Word, the father of thought. It is compensation that they are due. Use all your power to ensure it to them. Help the animal and the tree -- and defend them against the selfish and mean-spirited man. Give an armful of grass to the horse or the weary donkey, a bucket of water to the buffalo dying of thirst, harnessed since day-break with its heavy cart under the burning sky of the tropics; a friendly caress to the beast of burden, whatever it is, whose master treats it like a thing; nourish the dog or the abandoned cat that wanders in the uncaring city never having had a master; set a saucer of milk at the edge of the path and caress it with your hand if it allows you. Carry the green branch, torn off and thrown in the dust, into your house so that it is not trampled, and put it in a vase of water; it too is alive and is entitled to your solicitude. It has nothing more than silent life. That, at least, you can help it to enjoy. To live, that is its way -- the way of all the beings of flesh, to which the Word was not given -- of being in harmony with the eternal. And to live, for all these creatures, is happiness. But those who have the Word, father of thought, and among them the Strong especially, have something better to do than pursue "happiness." Their supreme task consists in finding this harmony, this accord with the eternal, of which the Word seems initially to have deprived them; to hold their place in the universal dance of life with all the enrichment, all the knowledge, that the Word can bring to them or help them to acquire; to live, like those who do not speak, according to the holy laws that govern the existence of the races, but, this time, knowing it and wanting it. The pleasure or the displeasure, the happiness or the discontent of the individual does not count. Well-being -- beyond the minimum that is necessary for each to fulfill his task -- does not count. Only the task counts: the quest for the essential, the eternal, through life and through thought. Attach yourself to the essential -- to the eternal. And never worry about happiness -- neither your own nor that of other men; but accomplish your task, and help the others achieve theirs, provided that it does not thwart your own. He who has the Word, father of thought, and who, far from putting it in service of the essential, wastes it in the search for personal satisfactions; he who has technology, fruit of thought, and who makes use of it especially to increase his well-being and that of other men, taking that for the main task, is unworthy of his privileges. He is not worthy of the beings of beauty and silence, the animal, the tree -- he who himself follows their path. He who uses the powers that the Word and thought give him to inflict death and especially suffering on the beautiful beings that do not speak, in view of his own well-being or that of other men, he who uses the privileges of man against living nature sins against the universal Mother -- against Life -- and the Order that desires "noblesse oblige." He is not Strong; he is not an aristocrat in the deep sense of the word, but petty, an egoist and a coward, an object of disgust in the eyes of the natural élite. All society, all "civilization" that proceeds from the same aspiration to human well-being above all, to well-being or human "happiness" at any price, is marked by the seal of the Powers of Decadence, enemies of the cosmic order of the play of forces without end. It is a civilization of the Dark Age. If you are obliged to suffer it, suffer it by unceasingly opposing it, denouncing it, combating it every minute of your life. Make it your glory to hasten its end -- at least to cooperate with all your might with the natural action of the forces leading to its end. For it is accursed. It is organized ugliness and meanness. Rid yourself not only of the superstition of "happiness," if it ever allured you, but also that of man. Protect yourself from the attitude, as vain as it is stupid, that consists in trying "to love all men" simply because they are men. And if this attitude was never yours, if, from childhood, you were impermeable to the propaganda of the devotees of "humanity," give thanks to the immortal Gods to whom you owe this innate wisdom. Nothing prohibits to you, certainly, from giving a hand to a man who needs help, even the most worthless. The Strong are generous. But in that case, they would be good to him as living flesh, not as a man. And if it is a question of choosing between him and a creature deprived of the Word but closer to the archetype of its species than he is to that of the ideal man, i.e., the superior man, give your preference and your solicitude to this creature: it is more an artwork of the eternal artist. For "man," who is esteemed so highly, is not a reality but a construction of the mind starting from living elements of a disconcerting variety. No doubt all "species" are a construction of the mind: their names correspond to general ideas. But there is an enormous difference: the living realities that are the individuals of each species resemble each other. The species exists in each one of them. All the specimens that are attached to it reflect the eternal to the same degree, or thereabouts. The individuals of the same race, races that do not have the Word, are almost interchangeable. Their possibilities are fixed. One knows what the world of living things gains every time a kitten is born; one knows what it loses every time a cat, young or old, dies. But one does not know what it gains -- or loses -- every time a human baby is born. Because what is a man? Thus I repeat: one does not know, one cannot predict, what the world of living things gains or loses every time a young being called human is born or dies. And the less the race is pure, i.e., the fewer possibilities each baby has from the start, and roughly uniform -- and also, the less the society tends to pour all individuals of the same group into the same mold, i.e., the less it tends always to encourage the development of the same possibilities, and that, roughly, in the same direction -- the less it is possible to guess it. Because then, the more the exception -- unclassifiable individuality -- will be frequent within a group of the same name, this "name" corresponding no more to reality. It will be relatively possible, and also easy, to envisage in precise circumstances the reactions of a member of an American Indian, African, or Indian tribe -- say, a Jivaro or a Masai or a Santal remaining in his natural environment and subjected to his tradition -- and those of an Aryan (German or not) who is at the same time an orthodox Hitlerian. It will be more difficult to envisage those of an unspecified non-aligned Western European. It is, however, true that -- beyond a certain degree of mixing of races and cultures and conditioning on a vast scale, thanks to all the modern means of communication -- people end up resembling each other strangely, psychically if not physically; they resemble each another in nullity. They think that everything testifies to their independence and originality, yet, in fact, their reactions in similar circumstances are as identical as those of two individuals of the same tribe of Blacks or Red-skins, or ... those of people of the same race, bound by the same faith. The extremes meet. The ethnic chaos of the masses of a metropolis at the forefront of technological progress tends to acquire a uniformity of grayness, a kind of manufactured homogeneity -- desired by those who control the masses -- a sinister caricature of the relative unity natural to people of the same blood that binds a scale of values and common practices; a uniformity which, far from revealing a "collective mind," at whatever level of awareness, reveals only the deterioration of a society that has definitively turned its back on the eternal -- in other words: a damned society. But one can still sometimes discover an exceptional individual within such a society, an individual who disdains the ethnic chaos that he sees around him and of which he is perhaps himself a product, and who, in order to escape, adheres to some doctrine of the extinction of the species, or even puts himself completely at the service of a true race, with all the renunciation that entails for him. The mechanism of heredity is so complex and the play of external influences so random that it is not possible to envisage who among the children of a declining society will become such individuals -- no more than it is possible to envisage which new-born member of a tribe will aspire one day to something other than received values and ideas, or which child raised in a particular faith will hasten to leave it as soon as he can. The exception is sometimes probable and always possible in a human group, even if it is homogeneous -- which is not to say that, in practice, one can or even must always take this into account: that would complicate the relationships between groups ad infinitum. Moreover the exception, if he represents something more than himself, changes groups whenever he can. If there were an Aztec who was shocked by the sacrifices offered to the gods of his people, this man would be among the first to adopt the religion of the Spanish conquerors; and an Aryan of Europe who, in our time, feels only contempt for the "Christian and democratic" values of the West and dreams of a society in the image of ancient Sparta, adheres, if he has a taste for combat, to the Hitlerian faith. It follows from these observations that the concept of humanity does not correspond to any concrete reality, separable from the whole ensemble of living things. The Word and an upright stance, the only features common to all men, do not suffice to make them "brothers"; they do not mean that they are closer to each other than any one of them is to a being of another species. Thus there is no moral obligation to love all men, unless one postulates a duty to love all living things, including the most harmful insects, because a man (or a group of men) that, by nature or choice, spreads ugliness, lies, and suffering, is worse than any harmful insect. It would be absurd to fight the one, the least powerful and therefore the least dangerous of all, and to tolerate -- and worse, to "love" -- the other. Love, therefore, the higher man, the Aryan worthy of the name: beautiful, good, and courageous; responsible; capable of all sacrifices for the achievement of his task; the Aryan healthy and strong. He is your brother and your comrade in arms in the fight of your race against the forces of disintegration, he whose children will continue this sacred fight in your place, when your body is returned to the elements. Respect the man of noble races other than your own, who carries out, in a different place, a combat parallel to yours -- to ours. He is your ally. He is our ally, be he at the other end of the world. Love all living things whose humble task is not opposed in any way to yours, to ours: men with simple hearts, honest, without vanity and malice, and all the animals, because they are beautiful, without exception and without exception indifferent to whatever "idea" there may be. Love them, and you will see the eternal in the glance of their eyes of jet, amber, or emerald. Love also the trees, the plants, the water that runs though the meadow and on to the sea without knowing where it goes; love the mountain, the desert, the forest, the immense sky, full of light or full of clouds; because all these exceed man and reveal the eternal to you. But despise the mass man with his empty heart and shallow mind; the mass egoist, mean and pretentious, who lives only for his own well-being and for what money can buy. Despise him, while using him as much as you can. If he is of our race and sufficiently pure, then from him children can be born who, educated in our care at a time when we will again have our say, will be worth infinitely more than he is. It is the best, perhaps the only, service he can render. Any time that a man of good race, cheerfully integrated into "consumer society," disappoints you, tell yourself that he does not count as a conscious individual; only his blood counts. See in him only what the breeder of horses or dogs considers in his subjects: his pedigree. Let us be frank: what he says, believes, and thinks is of no importance. As for the enemy of immutable values, the enemy of Nature and Life -- he who would like to sacrifice the most beautiful to the least beautiful or the downright ugly, the strong to the weak, the healthy to the suffering, sick, and defective; he who rises up, alone or in a group, against the eternal: fight him with all the ardor of your heart, all the force of your arms, all the power of your intelligence. It is not necessary to hate him. He follows his nature and achieves his destiny while being opposed to the eternal values. He plays his role in the cosmic dance without beginning or end. But -- and precisely for this reason -- it is necessary and even urgent to fight him, and by all means, without respite and weakness. For he is your absolute opposite -- our opposite and consequently our natural enemy -- in the pitiless play of forces. Fight him with detachment and all your power: the Strong preserve a serene balance even in the most exultant fanaticism. Fight him with violence; fight him without violence -- as the case may be. Fight him by thinking day and night of the opposition between your role and his. Never underestimate ritual. Wherever it exists a certain order reigns. And any order implies submission of the individual will, discipline, hence renunciation -- preparation to pursue the eternal. Any true religion is a path open to those who tend towards the eternal, consciously or not. And there is no true religion without ritual. And as soon as there are rituals, simple though they may be, there is the outline of religion. I say "outline," for even though ritual is necessary, essential even, for all true religion, it does not suffice to create one. It is necessary that doctrines be added that are an expression of the Tradition, i.e., that help the faithful to live the eternal truths. Needless to say -- for it is plain to see -- among people who are attached nominally to a given religion, each one lives it more or less, and the great majority (at least in decadent ages such as ours) does not live it at all. One almost can define a decadent age simply by saying that it is an age when traditional doctrines, that is to say, those that raise the faithful to the contemplation of the eternal, cease to interest men, except for a negligible minority. In centuries when degeneration continues and is intensified, properly political doctrines, in the minds and hearts of the majority of people, take the place of the traditional doctrines, generally called "religious," and -- what is perhaps worse still -- men use the names of different religions for struggles which, in the end, are over nothing but personal and material advantages. The properly political doctrines are, contrary to those which concern the Tradition, centered on immediate concerns and "historical," i.e., temporal, considerations at most; on what does not recur -- what one will not see twice. A doctrine that helps its followers solve immediate problems of a political or even economic nature, while teaching them the truths that transcend those by far, and inculcating in them a corresponding scale of values, is something other than a political doctrine. It is a Weltanschauung, a "vision of the Universe." It would suffice to add rituals to it to make it the basis of a religion. And those of its followers who have a sense of ritual, a need for ritual -- which they express how -- ever they can, such as by observing auspicious and inauspicious dates, joyous or sad anniversaries related to the history of their community, or by visiting on certain dates places rich in meaning for them -- are already the faithful. But, I repeat: in order for a Weltanschauung, a vision of the Universe, a "philosophy," once infused with the magic of ritual, to become the basis of a true religion, it is necessary not only that it contain no internal contradictions, but also that its fundamental propositions are true, not relatively but absolutely; true at all times and everywhere; true in time and apart from time; eternally. It is necessary, in other words, that it rest on nothing less than the laws of the cosmos, on the laws of Life without beginning or end, the laws that apply to man but surpass man as they surpass all finite beings. It is necessary, in a word, that it have a cosmic philosophy capable of integrating itself into the eternal Tradition. Extremely rare are the alleged doctrines of "liberation," and rarer still are political doctrines (if their base is "philosophical"), that meet this condition. If one of them, while not meeting it, under the pressure of a need of the human heart as old as mankind, adopts rituals, it will tend to give rise to a false religion -- to a sacrilegious organization, in other words, a counter-Tradition. This is, in our age, the case with Marxism, insofar as a pretence of ritual life began to be introduced there. The humble and sincere Slavic peasant who, among many others, waits in front of the mausoleum of Lenin for the moment when he will finally be allowed to gather in the presence of the body, rendered artificially incorruptible, of the man who made the ideas of the Jew Marx the basis of a world revolution, is a man of faith. He came there in pilgrimage, to nourish his devoted heart, as his fathers went to prostrate themselves, in some famous church, in front of a miraculous icon. The food of the heart remains, or has become again, for him more significant than that of the stomach. There he would remain, if need be, for two days without eating and drinking, to live in the minute when he will pass in silence in front of the mummified flesh of Lenin. But the heart lives on truth, on contact with that which is, always and everywhere. The untruths that it believes divert it from this contact and leave, sooner or later, a hunger for the absolute. But the whole philosophy of Marx, adopted by Lenin as the foundation of the proletarian State, is based on flagrant untruths: on the assertion that man is nothing more than what his economic milieu makes of him; on the negation of the role of heredity, therefore of race; on the negation of the role of superior personalities (and races) in the course of history. The sincere man, religiously devoted to the Masters who have exalted this error in theory and unleashed from it a revolution on a worldwide scale, serves unknowingly the Forces of disintegration; those which, in the more or less dualistic terminology of more than one traditional teaching, one calls the "Powers of the Abyss." Among the doctrines of the twentieth century called political, I know of only one that, while being in fact infinitely more than "political," meets the condition sine qua non, without which it is impossible for a Weltanschauung, even with the aid of ritual, to be used as the basis of a true religion, namely, that it rests on eternal truths, exceeding by far mankind and its immediate problems, not to mention the particular people to whom it was initially preached and the problems they had then. Only one, I say, and I speak of the true Aryan racism, in other words, Hitlerism. In a passage of his novel The Seven Colors,* Robert Brasillach describes the consecration ceremony for the new flags of the Third Reich at one of the great annual meetings at Nuremberg, at which he himself was present. After the imposing procession of all the organizations dependent upon or attached to the National Socialist Party, the Führer solemnly advanced under the eyes of five hundred thousand spectators crowded on the steps of the immense stadium, on which reigned an absolute silence. One after another, he raised the new banners and put them in contact with the "Blood Flag": the standard that his earliest disciples had carried during the Putsch of 9 November 1923 and to which the blood of the Sixteen who fell this day had given a sacred character. In this way, each flag became similar to that one; "charged" like it with a mystical fluid by participation in the sacrifice of the Sixteen. And the French writer remarks, quite justly, that he whom the religious meaning of this act escapes "does not understand anything of Hitlerism." He emphasizes, in other words, that this act is a ritual. But this ritual, to which many others can be added, would never have sufficed to give Hitlerism the character of a religion, if it had not already been a more-than-political doctrine: a Weltanschauung. And above all, it would have been unable to make it a true religion, if, at the base of this Weltanschauung, there had not been eternal truths and a whole attitude which was not (and does not remain), in last analysis, anything other than the quest for the eternal even in what changes -- the traditional attitude par excellence. These words may seem strange in 1969, more than twenty-four years after the defeat of Hitler's Germany on the battlefield and the collapse of its political structure. They can seem strange, now that one would seek in vain, in the whole geographical region covered by the Third Reich, a visible sign of the resurgence of National Socialism such as the Führer intended it, and that the majority of the organizations which, beyond the old frontiers of the Reich, claim they would rescue the condemned Movement, are just pale imitations without heart, or just lamentable caricatures, sometimes in the service of other goals. But the value of a doctrine -- its truth -- has nothing to do with the success or the failure of its members on the material plain. This success or failure depends on the accord or discord of the doctrines with the aspirations of people at a given moment of history, and also on the fact that its adherents are or are not, from the military point of view, the diplomatic point of view, from the point of view of the art of propaganda, able to impose themselves -- and consequently do impose themselves -- on their adversaries. The fact that the doctrine is or is not an expression of cosmic truth is of no account here. But it submits in the long run, right or wrong, to these doctrines, in the sense that a society that refuses to accept a teaching in harmony with eternal laws and prefers untruths works for its own disintegration, in other words, damns itself. It is equally correct that very many acts of violence were committed in the name of Hitlerism, and it is for them that it is reproached so obstinately by the herd of right-thinking people, the "decent people," deeply attached (in theory at least) to humanitarian values. There are, however, two kinds of acts of violence -- or acts leading to violence -- "committed in the name of a doctrine." There are those that, in the spirit of the doctrine, are necessary, or at least justifiable, in the circumstances in which they take place. And there are those that are by no means that way, and whose authors, far from being true followers of the doctrines, of which they display the visible symbols, represent in reality only themselves and use the prestige of the doctrine and the authority that it confers on them to promote their own interests, to satisfy personal grudges, or simply to give free reign to their passions. 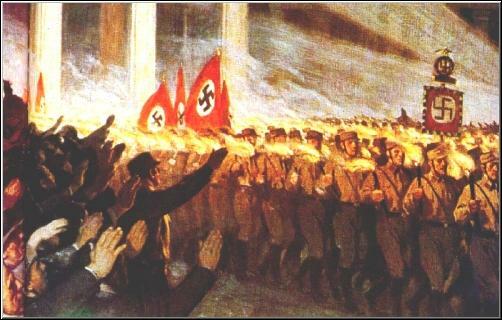 Unjustified acts of violence committed, under cover of "reasons of State," by opportunists disguised as Hitlerians, do not touch in the least the cause of the German Reich: the application of Hitlerism to the problems of Germany at a given time; a cause, moreover, to which they rendered disservice rather than service. Even less do they touch the Hitlerian doctrines themselves. The acts of violence committed in the spirit of Hitlerism -- according to its profound logic -- far from calling its truth into question, on the contrary, only underscore it. For the application of a true doctrine -- that is to say, expressing the very laws of life -- in a society, however privileged, of the Dark Age, in other words, in a society which, along with all humanity, is, in spite of its progress on the technical level, and perhaps because of it, in regression from the point of view of Nature, can only be done "against Time"; against the universal current of decline that characterizes the Dark Age. And that is materially impossible without violence. Among the proselytizing international religions, it is, to my knowledge, only Buddhism that was spread practically without violence. And note that it is the religion of renunciation, the religion "of extinction" par excellence; that which, applied absolutely, would lead to exalting celibacy -- like Jainism, its contemporary, confined to India, and like Catharism, many centuries later -- inciting mankind to leave the planet. Christianity, centered on the love of man, alone among living beings created (according to it) "in the image of God," was largely propagated by bribery and violence, under the patronage of kings or emperors who believed they were serving their interests by proclaiming it the state religion and imposing it on conquered peoples. Innumerable crimes against man -- and, in general, against superior men -- have marked its expansion, from the massacre in 782, by order of Charlemagne, in Verden on the Aller, of four thousand five hundred German chiefs, faithful to the gods of their fathers, to the butchers of the Holy Inquisition -- crimes that do not preclude all that Christianity has retained of the eternal Tradition, which remains unshaken. And it acts, here, as a religion whose founder himself declared that his kingdom "is not this world"; as a religion, therefore, to which violence is, in principle, foreign. If it is true that the acts of violence of its adherents do not at all decrease its value, as such, it is more so with the adherents of doctrines, centered, not on man considered as a being "apart," but on Life, and the fight without end that it implies -- of a doctrine like Hitlerism, whose spirit and application in this world can only go against the current of our time -- do not alter at all its excellence as an expression of immutable laws. A strictly political doctrine is judged by its success. A doctrine likely to receive the consecration of ritual -- or already having received it -- is judged by its approach to eternity, whatever may be the consequences, happy or unhappy, that accrue to it on the political plane. On 28 October 1953, in front of some comrades, very few in number, gathered at Holzminden on the Weser, the Hitlerian Félix F. told me: "Up to 1945, we were a party; after 1945, let us be the core of a great international faith." He believed, no doubt, that even in an age of universal degeneration such as ours, the Strong of Aryan blood were still numerous enough and conscious enough to be linked in a "great international faith" around the only doctrine worthy of them. Only the future will tell if he was right or not. But I affirm today that, even if stripped of everything that could be contingent -- temporal -- in its first expression as a political doctrine, Hitlerism never managed to impose itself on the Aryan élite wherever it exists, it nevertheless remains the Way of the Strong, open to the eternal, their asceticism, in all ages of accelerated decadence, at all "ends of the cycle." All true religions, all those that can be integrated into the Tradition, lead to the eternal, certainly. But they do not carry all the same people to it. The religions "of extinction," as I call them -- such as Buddhism, Jainism, and later Catharism -- guide the lost and the desperate for whom the absence of hope is suffering, people broken or rejected by the fight without end and who aspire to "leave it." The doctrines that preach action in detachment and enthusiasm without hope are addressed to the Strong, to those whom the fight, though "useless," never tires, and who need neither the anticipatory vision of a paradise after death, nor that of a "better world" for their sons and their nephews, to fight with zeal and until the end, according to what is, for them, duty. The Varnashramdharma of the Hindus -- a religion based on the natural hierarchy of the castes (thus of the races, the Hindu castes being hereditary and having nothing to do with the goods that can be acquired) and on the natural succession of duties in the course of a man's life -- is a religion of the Strong. It is dominated by the doctrine of detached Action as it has reached us in the Bhagavad-Gîta. It was conceived as the basis of a traditional society, already decadent, no doubt -- the decline begins, in each temporal cycle, at the end of the first Age, called the Age of Truth, Satya Yuga, or Age of Gold -- but incommensurable with ours, as it is infinitely closer to the ideal or divine order. Hitlerism considered in its essence, i.e., stripped of all that attaches it to the political and economic contingencies of a particular time, is the religion of the Strong of the Aryan race, as opposed to a world in decline; a world of ethnic chaos, contempt of living Nature, the silly exaltation of "man" in all that is weak, morbid, eccentrically "individual," different from other beings; a world of human selfishness (individual and collective), of ugliness and cowardice. It is the reaction of the Strong of this race, originally noble, to such a world. And it is that which they offer to all their brothers in race. But that is another question. Let us return to what constitutes the eternity of Hitlerism, that is to say, the not only more-than-political but more-than-human -- cosmic -- character of its basic truths, in particular of all that relates to race, biological reality, and the people, historical and social reality. It is a return, pure and simple, to the ancient conception of the people: of the German conception, certainly, but also the Greek, that of the Romans before the Empire, with that of all peoples, or almost all. It is the negation of the Roman attitude of the centuries of decadence, which allowed any inhabitant of the Empire, any subject of the Emperor, to become a "Roman citizen," be he Jewish, like Paul of Tarsus or Flavius Josephus, or Arab, like the Emperor Philip -- and, later, it sufficed to be "Christian," and of the same Church as the Emperor to be an Byzantine "citizen," able to reach the highest offices. * It is the negation of the ideas of the "people" and the "citizen" such as presented by the French Revolution at the moment when, at the suggestion of the Abbé Grégoire and others as well, the Constituent Assembly proclaimed "French" all the Jews residing in France and speaking French. It is race in the broad sense of the word that gives a people its homogeneity across time; that makes it remain, in spite of political and economic upheavals, always the same people, and through which the individual, in renouncing what is his own and putting himself totally in its service, approaches the eternal. One could undoubtedly say that neither the people nor the race nor mankind -- nor even the life on a given planet -- will always endure. Moreover "duration," which is "time," has nothing to do with timeless eternity. It is not the indefinite succession of the generations, physically and morally more or less similar to one another, but the ideal Archetype which these generations approach to a certain extent; it is the perfect type of the race, towards which each specimen of this race tends more or less, that we consider when we speak about the "eternity of the race." The people which, even in the midst of the ethnic chaos that reigns more and more everywhere on earth, "devotes all its energy" to preventing interbreeding and "to promoting its best racial elements," writes the Führer, "is sure to become sooner or later the master of the world,"* (provided, naturally, that it is a dynamic and creative people). Consequently, it will live; it will remain a true people, while each of its competitors, more and more invaded, submerged by heterogeneous elements, will have ceased to be such -- and for the same reason, cease to merit (and to rouse) the sacrifice of individuals of value. The sincere man who, in agreement with the spirit of Aryan racism, i.e., of Hitlerism or any other noble racism, effaces himself before a true people that is his; who, in order to serve it above all, tramples personal interest, money, pleasure, the glory of his own name; this man approaches the eternal. His good citizenship is devotion and asceticism. But he needs a true people to serve. For he who is devoted to a mixed "people," in other words to a human community without race and definite character, a "people" in name only, wastes his time. His activity is a little less shocking than that of people who devote themselves to the service of the handicapped, retarded, deficient, of human refuse of all kinds, because the mongrel, if he is healthy in body, is nevertheless quite useful. Just the same, it would be better for an individual of value who emerges by chance from a "people" which is not one, to devote himself in all humility to a true people of a superior race, or that he be content to serve innocent life, beautiful non-human life, that he defend animals and trees against man, or, if he can, that he combine the two activities. Perhaps then -- supposing the widespread Indian belief in an unknown reality -- he will be reborn one day in a human community worthy of him ... provided that he does not act in view of such an honor, that he never desires it. Never forget that the race -- the racial Archetype towards which all generations of the same blood tend (with more or less success) -- is the visible and tangible eternity, concrete to some extent; it is the only eternity available to all living things, because of which, simply in living -- prolonging faithfully and immutably their species, without any thought -- they have already gone beyond Time, by the door of individual renunciation. It is curious that the more beings are strangers to the word and to thought, the more they are unshakably faithful to the race. If one admits, as I would readily, that "the Divine sleeps in the stone, wakes up in the plant, feels in the animal, and thinks in the man" (or at least in certain men) one will admire first, in all the bodies of the same chemical family, i.e., of a similar atomic structure, which accord perfectly with the "type" that they represent and which they cannot deny, a harmony that we call their common function. One will also admire no less the fidelity of each plant -- from the oak, the cedar, the conquering banyan to the vulgar dandelion -- to its race. It is not here a question of spontaneous interbreeding. It is not a question with animals either, as long as those remain "in a natural state," i.e., out of contact with man, including even the men said to be the most "primitive" -- those who remained at, or later descended (through poverty of words and increasing absence of thought) to the level of the primates deprived of articulated language, or lower still. The mixture began with the evil pride born of the Word: the pride that pushed the man to believe himself a being apart and against the iron laws that attach him to the earth and to Life; that made him dig an imaginary trench between himself and all other living things; that encouraged him to place his whole species on a pedestal; to scorn, in the name of the false fraternity of the Word, flagrant racial inequalities, and to think that he could with impunity bring together what Nature separates; that he was "superior," above this prohibition, above divine law. Hitlerism represents, in the midst of ethnic chaos, in the midst of an epoch of the world's physical and moral decline, the supreme effort to bring the thinking Aryan back to respect for the cosmic order as it is affirmed in the laws of development, conservation, and disintegration of the races, back to willing submission to Nature, our Mother -- and to lead back, willingly or by force, the non-thinking Aryan, who is nevertheless valuable because of the possibilities of his descent. The cult of the "people" -- at the same time of Blood and Soil -- leads to the cult of the race common to people of the same blood and the eternal Laws that govern its conservation. The preceding text is chapter 1 of Savitri Devi's Souvenirs et réflexions d'une Aryenne (Calcutta: Savitri Devi Mukherji, 1976). Trans. R.G. Fowler.